As the final term of this academic year rolled into action, I had a tutorial with the lovely Bridget, who I was pleased seemed excited about my change in direction. This is the first tutorial I have had since the MYR – I’ve actually made quite a lot of progress over the holidays. Following on from our chat, I thought it would be useful to get my thoughts in order on where I am and where I can go next. I need to keep developing my idea and experimenting with new processes – not get stuck on resolving one idea (although I want to do this too). I also want to draft an artist’s statement of sorts – after being posed the question by one of the class – I think it is about time for us to be able to answer this, even as a first draft. My research question as it stands, is “how can we use the boundaries between material, place and time to explore our sense of place?”. All the research I have done so far into place, identify and psychogeography has lead me to my own hypothesis that I want to explore through my MA project. That is – that our connection to place is defined by knowledge: be that specific local knowledge related to the nature or culture of the place, or knowledge from mind or memory which is overlayed onto place creating a unique experience in space-time. The French philosopher Maurice Merleau-Ponty (1908-1961) had a complementary view on our relationship with knowledge. He wrote on the fundamental role that sensory perception plays in how we understand the world. He argued that “knowledge is ‘felt’…consciousness, the human body and the phenomenal world are therefore inextricable intertwined…and the material world itself is therefore not the unchanging object presented by the natural sciences, but instead endlessly relational“. If place is defined by knowledge, then I believe knowledge is defined by language. It is the ability to articulate our experiences which allow us to fully understand them. Spoken, written or visual….readable or codified, the purpose is the same, the communication of ideas. Roger Macfarlane in his book Landmarks , comments that “the contours and colours of words are inseparable from the feelings we create in relation to situations, to others and to places“. However as knowledge of places are lost, so is something of the experience of those places. Macfarlane goes on to discuss the words for our natural phenomenon and entities, that “there are fewer people able to name them and once they go unnamed they go to some degree unseen”. Leading geographer Yi Fu Tuan  also supported this view; he proposed that “it is precisely what is invisible in the land that makes what is merely empty space to one person, a place to another”. So with all of this said, where do I position my work? Currently, my intention is to create a language which allows us to experience a sense of place, capturing unspoken or unknown/unknowable meanings. A wordless language that is before and beyond the specificity of naming, embedding meaning through local knowledge: the wisdom of the cunning man, the path of the flâneur. Practically, I am still looking at processes which embed elements of wildness into my materials – wildness through releasing energy, free-will, serendipity. This will bring in the natural dyeing I have been exploring and the transformation of materials with factors not all under my control. I want to expand this from just the material to look into the language of mark-making as well. I have a few ideas of where to explore this term, using handmade pigments and paints as well as more of the asemic calligraphy work which has been bubbling away in the background. Overall, I’m excited about what’s ahead. This entry was posted in 03.3 MA Project proposal, 03.4 Tutorials and seminars and tagged artistic research, language, lightbulb moment, place on 20 May,2015 by antalbot. By three methods we may learn wisdom: first, by reflection, which is the noblest; second by imitation which is the easiest; and third by experience, which is the bitterest. Reflective practice was today’s underlying theme – whether by planning or good luck, in both of our sessions. The aim is to make us more aware of ourselves and what we are doing. We had reflective practice initially defined as “the capacity to reflect on action so as to engage in a process of continuous learning”. Working with the lovely Bridget we went through a couple of very interesting exercises. The first one was being presented with a block of play dough and given 2 minutes to make something with it. We then had to reflect with a partner on what, why, how we had made what we had! This was my resulting object(s). Curious, I thought. 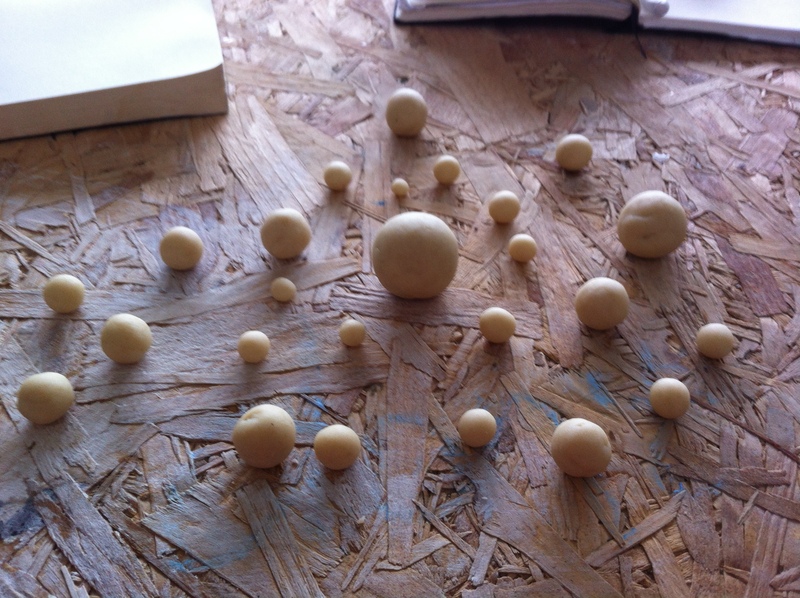 I started smoothing out my lump of dough, and in making a smooth ball, was inspired to make more of them. I liked the repeated form, the simplicity of the ‘perfect sphere’. My colleague suggested it looked like stars in the sky with the different scales – I hadn’t noticed this when making it. Why you make something is always the hardest question to answer, especially when you are asked it seven times! After this exercise we had a more in-depth piece of reflection to do based on a recent event of our choice, following a useful set of questions we can use. Introduction: What was the event? Analysis: What were you thinking? What were you feeling? Surprises: What surprised or puzzled you? Improvements: What can be learnt or improved for next time? Having had my tutorial with Maiko only yesterday, this seemed like the ideal event to analyse and reflect on. Doing the exercise was quite surprising in what pearls of wisdom you can pull out that you didn’t even realise you were thinking….highlights below (full original notes in my notebook). Good dialogue and discussion but I rambled too much, and I don’t think I articulated my current proposal very well. Perhaps this suggests it is not yet a very clear argument / question and if I can’t explain it to my tutor it needs a bit more clarity. It is clear that I am not sure of what my ‘right materials’ are yet either or how to align my proposal with my current practice. I took in my sketchbook but didn’t get a chance to show Maiko. Perhaps I am so keen on having a real fine-art style sketchbook that I am restricting my natural research style. I need to do what is true to me and not someone else. Don’t try so hard! I am very good at planning and managing very complex projects – but I haven’t used any of the skills or tools I would have on starting a consultancy assignment. Why not? I don’t need to disregard my last decade’s worth of experience!! While we’re talking about planning, it is good! You can’t rely wholly on instinct, and although I am sure following my instincts will be essential I don’t need to make life hard for myself. Echoes of my City Lit course where I got myself in knots trying to develop an instinct (being told not to plan didn’t help) but ended up making my project twice as hard as it needed to be. Cyclical: the old Plan-Do-Review cycle, never quite as simple as the management books show. Everything is iterative and complex and you go backwards, sideways and upwards as well as forwards. Puzzlement is good – it offers a chance to do something new and change something. Get out of your comfort zone! Qualitative: my inner physicist says “you’re not in Kansas any more”; success in qualitative research is about a different type of value with the outcomes achieved – not just objective interpretation of data. Much more like the constructive ‘waffle’ I have got rather good at as a consultant. Emphasis on words. Reflective: our MA programme is essentially two years of critical reflection. You need to not look at your work in isolation, but to look at all of you while you were doing it, how did you feel, what frustrated you etc. This is just as true of any professional practitioner, not just creatives. We were right: we were asked to answer a few simple but incredibly hard questions and discuss them with our neighbouring students. There are some big fish in here – and bang on what I was thinking about this morning. 3. What have you done so far [on the MA]: well as you can see from my earlier posts, this is actually rather a lot in a short time – inductions into new materials, talks and exhibitions galore, I have made a pot, a clay dinosaur and a metal bowl, oh and three iterations of my project proposal in three weeks! That I actually really enjoy research; I didn’t realise how much I missed it. That I don’t currently have a defined enough vision, which is why (I suspect) that I am finding it hard to set objectives. Breaking the rules of strategy 101! I will ensure to draw upon all of my past experiences, everything I have ever done has brought me to this moment – everything you know makes you YOU. I will learn to balance meticulous planning with raw intuition. Both can live side by side. Reflect on my current practice – it may be craft-based and not uni taught, but it is just as valid as an expert potter or a fine artist. Phew. I realise I have now hit 1400 words for this post so thanks to any committed readers who have made it this far. This was a big day. On Jonathan’s suggestion, I am going to file this post under LIGHTBULB MOMENTS to come back to as turning points for the course. Now of course, I just need to get on and start answering the questions. I think I will settle down to this over the next few days and seek to start making in October with a proper thought through plan for the rest of term and beyond. How’s that for a decisive day! This entry was posted in 03.1 Getting making, 03.3 MA Project proposal, 03.4 Tutorials and seminars and tagged artistic research, reflective practice on 24 September,2014 by antalbot.